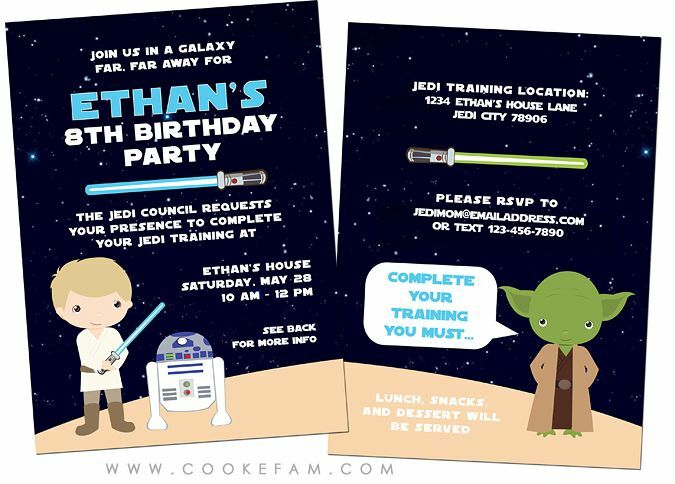 I was not in the least bit surprised that Ethan wanted a Star Wars themed birthday party this year. I was kind of ready for it. 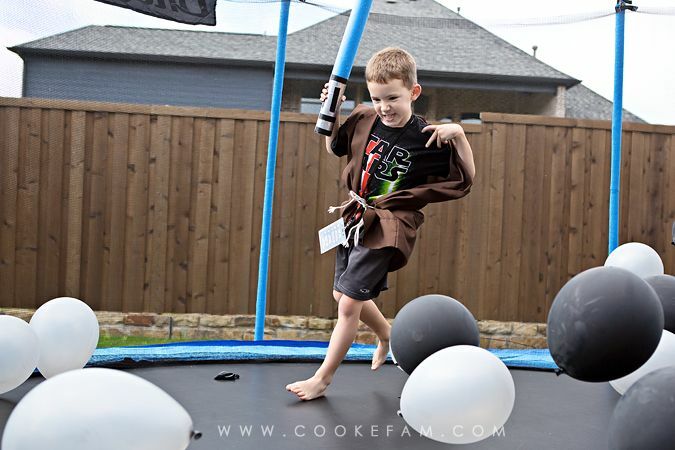 Despite his affinity for Storm Troopers, he decided on a Jedi Training party. 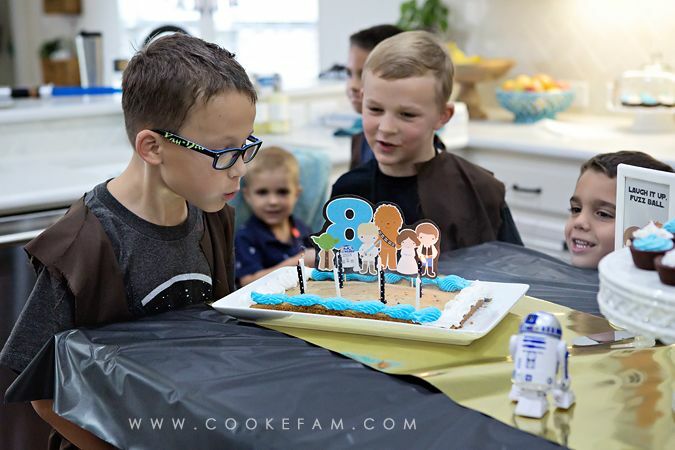 We all wore our Star Wars shirts for the big day. 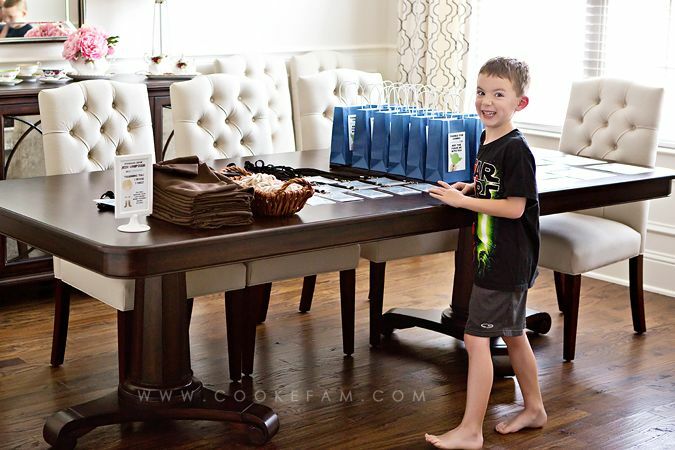 The dining room table was covered with the things we'd need when the guests arrived and departed. 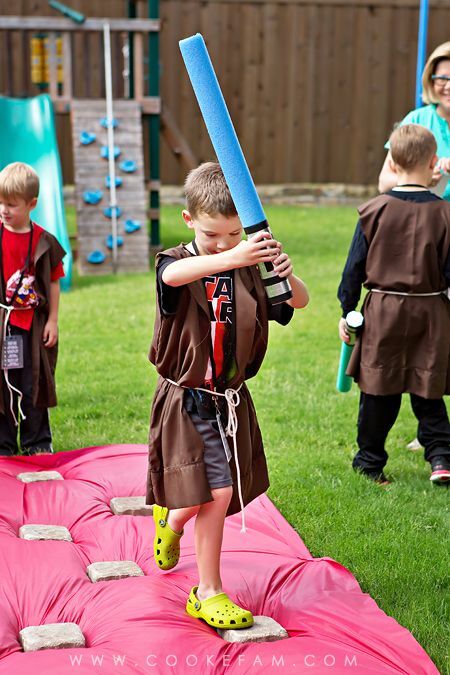 Upon arriving at the party, each guest dressed up as a Jedi in training. 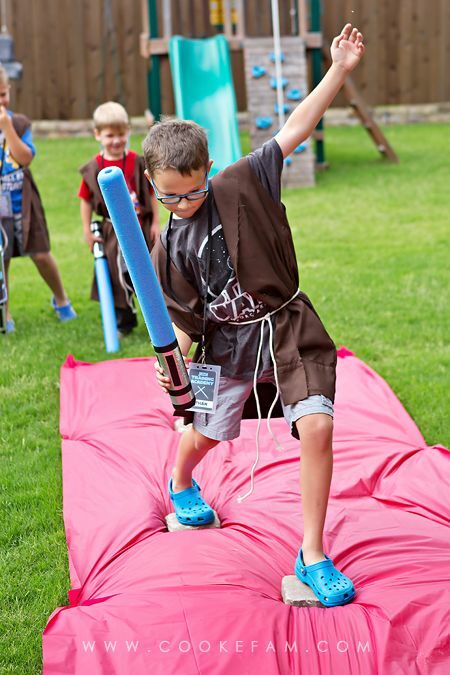 I had made Jedi robes out of brown pillow cases that we tied with a bit of rope for a belt. 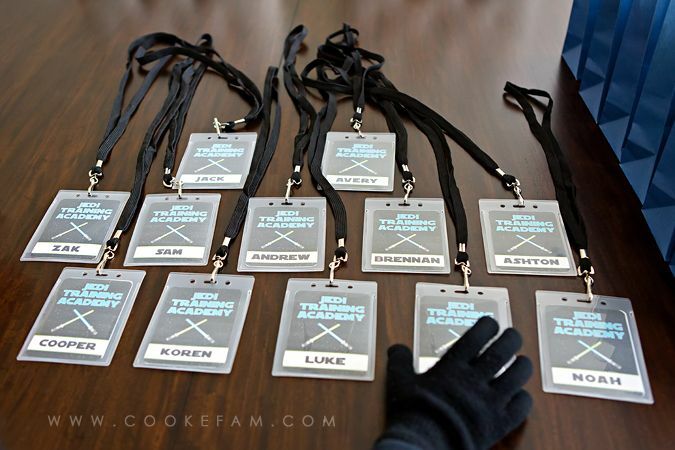 Then the trainees had to find their name on their training tag and wear that around their neck. I didn't take a photo of the back side, so here it is. 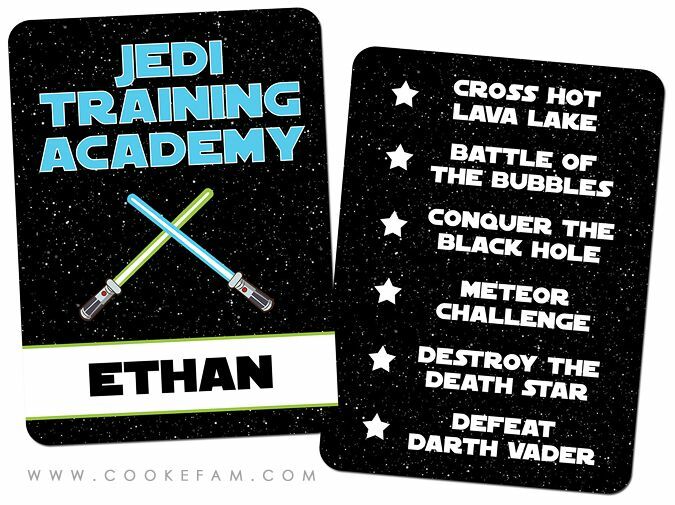 Listed on the back were the tasks each trainee had to complete to become a true Jedi. They received a gold star on top of the white star for every challenge they completed. 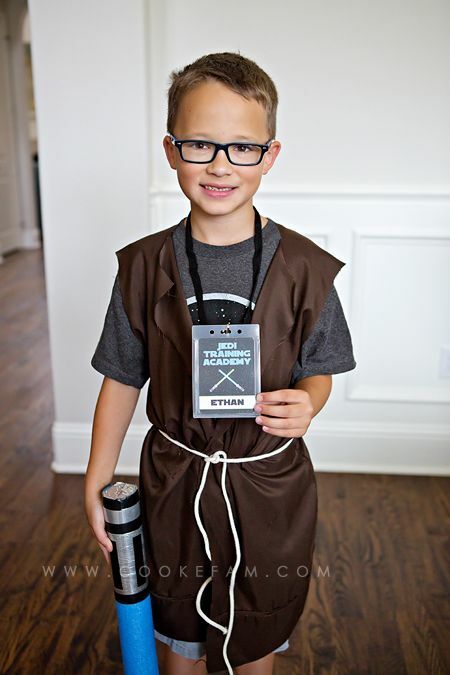 Ethan was the first to get dressed and show me his training tag. 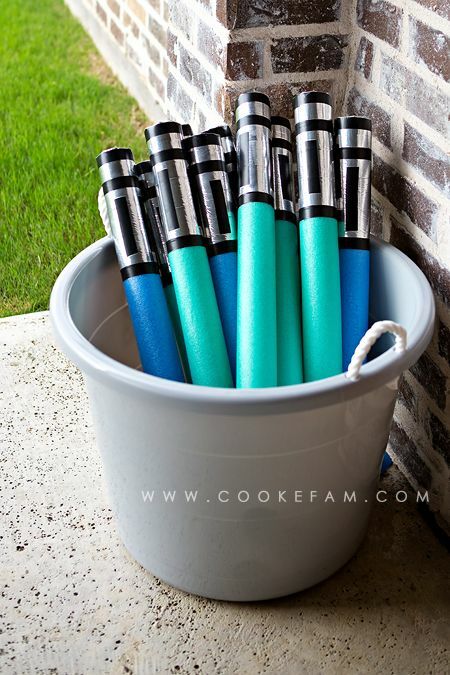 The light sabers were in a bucket outside, but of course, they made their way inside the house anyway. 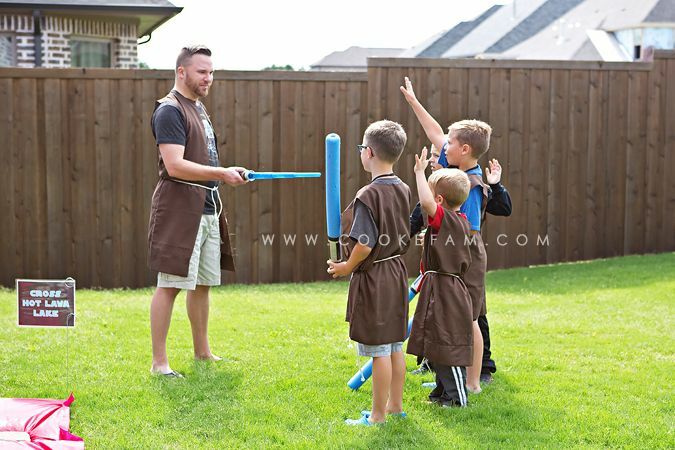 After getting dressed for training, the kids were supposed to go outside in the back yard and select their light saber. I found these pool noodles for $1 each at Big Lots. 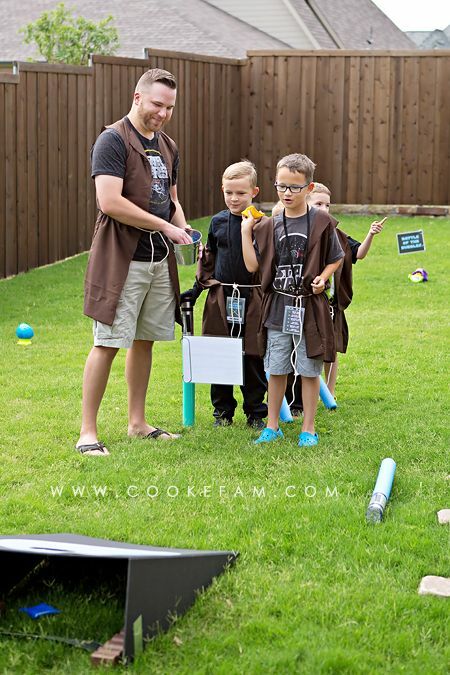 I cut them each in half and used silver duct tape and black electrical tape to transform them into light sabers (like you see all over Pinterest - this was not my idea). I had NO idea how much of a hit these would be. First of all, they are soft, so when the boys inevitably hit each other with them, they didn't hurt. Brilliant. 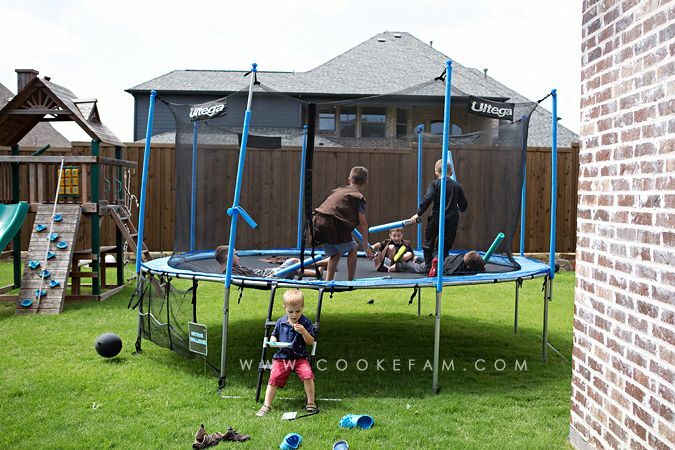 The week leading up to the party my boys would take a couple outside on the trampoline and play with them for hours. Hours. And they are still doing it after the party too. 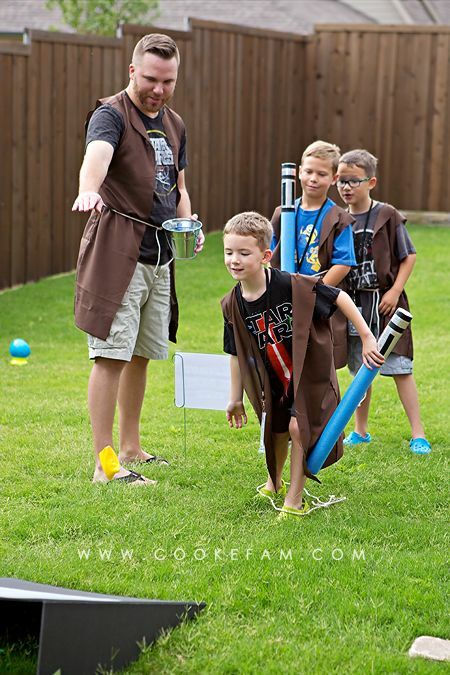 For something so cheap and easy, I am amazed at how fun they were for the kids (ok, and Casey too). 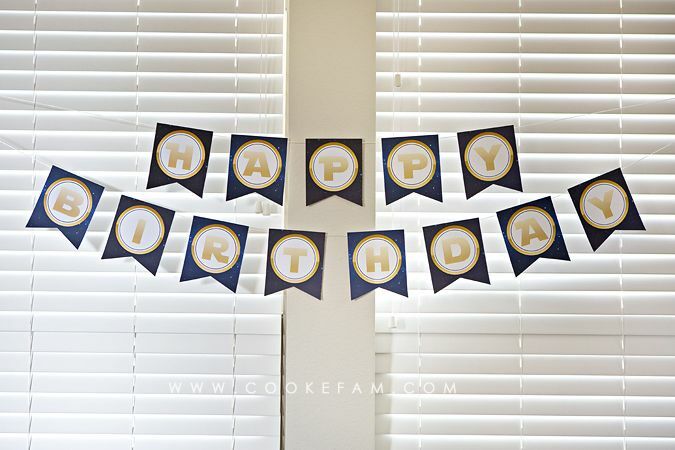 Inside, I kept things more simple than I ever have for a party. I knew we'd be spending the majority of our time during the party outside, so I just didn't go ALL out like I have in the past. This was also the year I decided not to cook or bake anything for the party. Nothing. I ordered pizza and bought this cookie cake (a special request by Ethan) instead of baking one myself. I bought the brownie bites too...and added the blue and white icing from store bought icing. 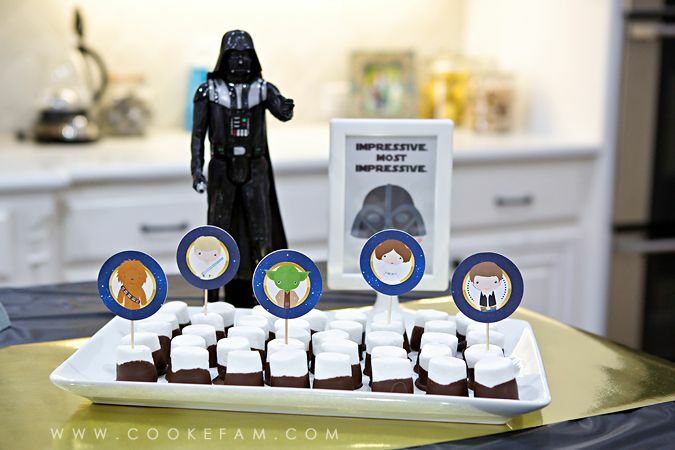 I did dip these marshmallows in melted chocolate. And I obviously made a few paper picks to help decorate the deserts. 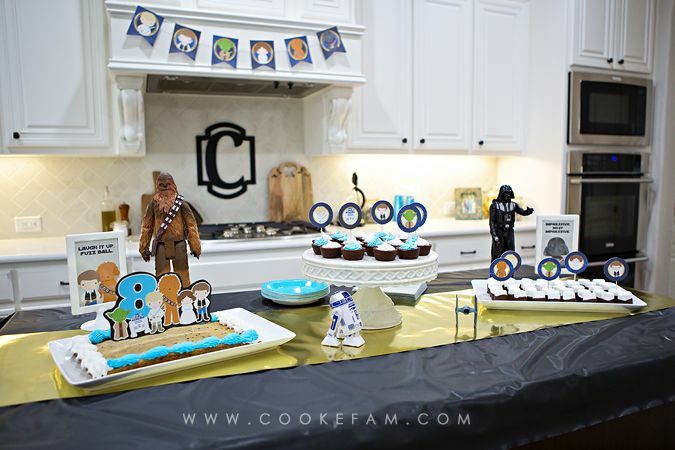 I have used these IKEA photo frames for several parties now. They're so easy...this time I just put characters with quotes on each side. 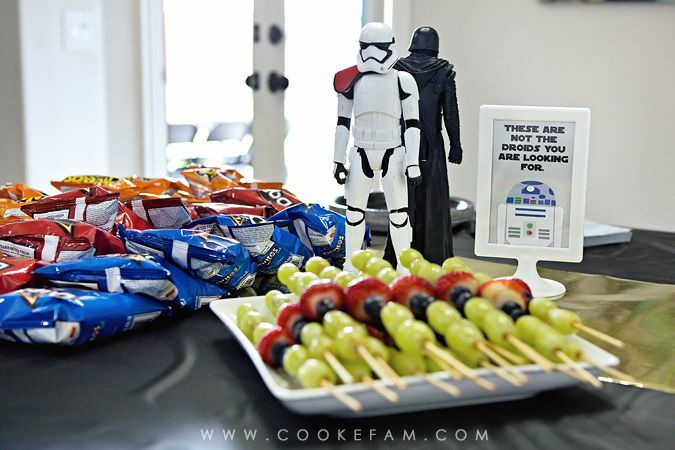 The only other thing I "made" for the party were the fruit kabobs. The boys gathered all their Star Wars figures and brought them downstairs. They helped me find places for them on the tables. 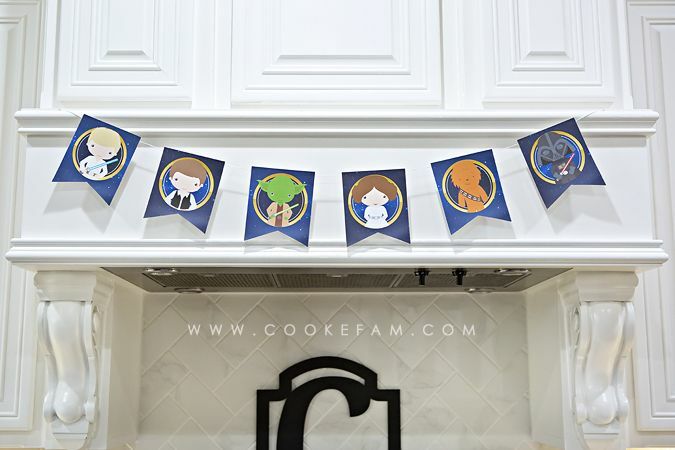 Easiest decor ever. 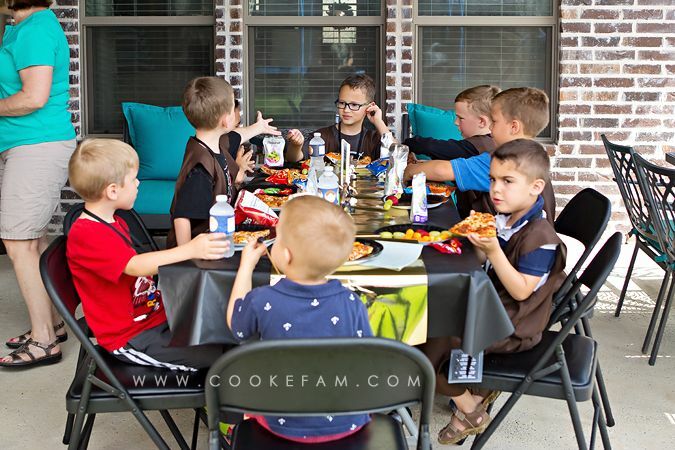 I set up my long rectangular table outside for the kids to eat. 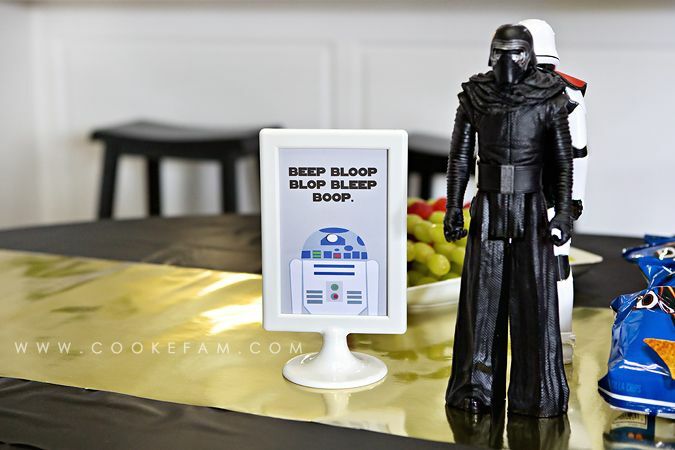 I've found that a very simple and interactive table decor for the kids is the way to go. 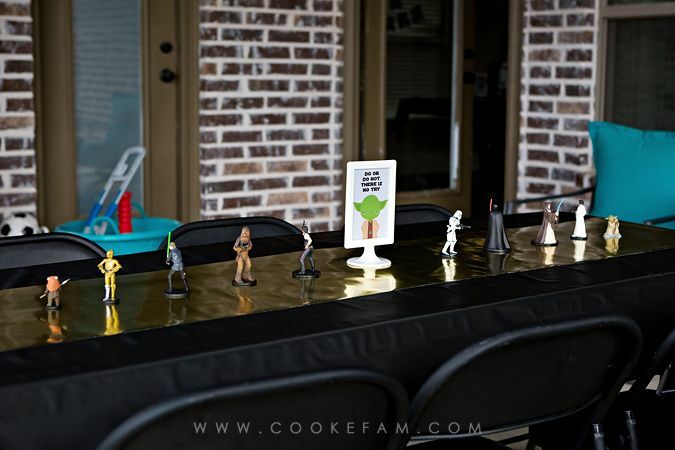 They loved looking at and playing with the small figures when they were eating later in the party. I had juice and water for drinks and that's it. I kept it so simple that I almost felt like I was forgetting something. 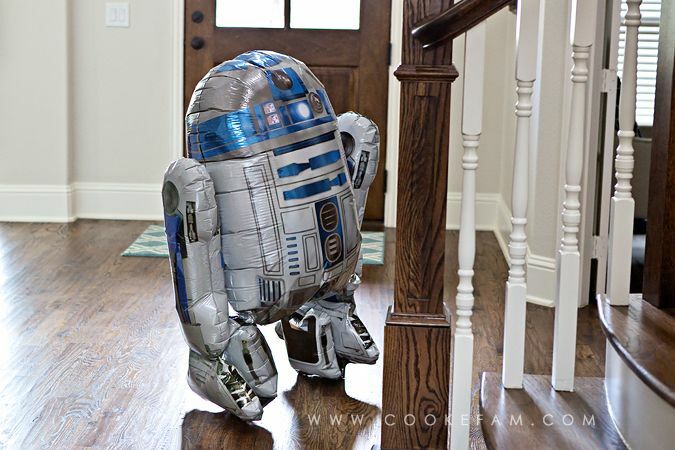 My mom got the boys this air walker balloon of R2D2 earlier in the week and of course he made an appearance at the party and was a big hit. 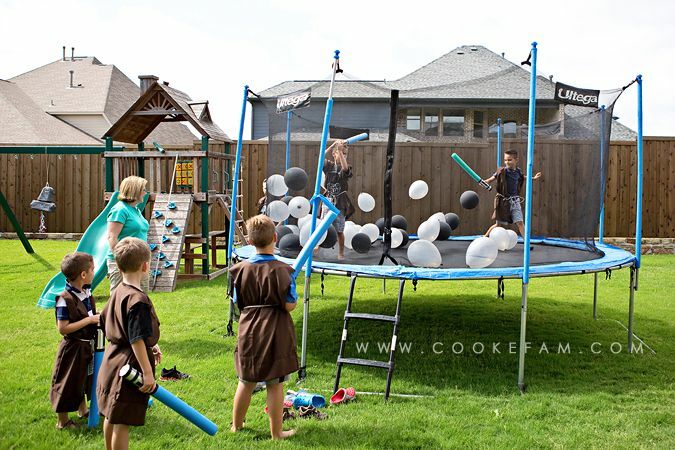 Again, I had intended for the light sabers to stay outside...more room to swing and such without breaking anything. 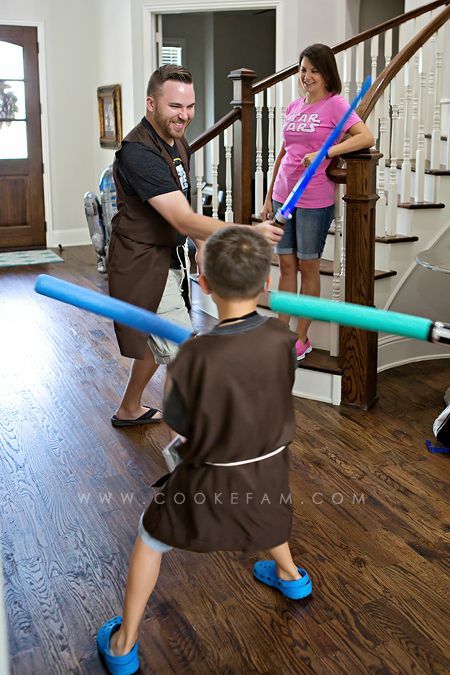 But my dad caught Jedi Master daddy and Ethan engaging in a spar inside the house. 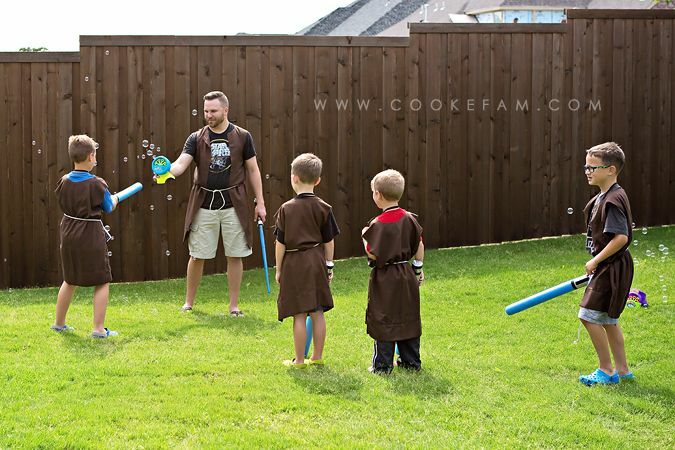 After everyone was dressed and ready, we lined them up outside to begin the Jedi Training. They were ready. Casey was the trainer/teacher and he did a fantastic job with the boys. They ate it up. 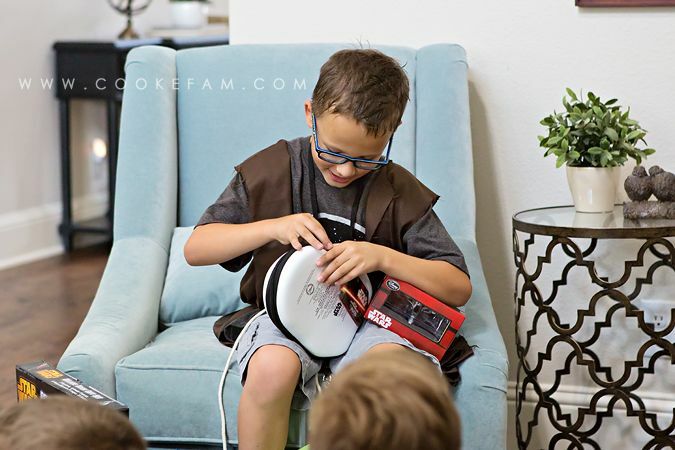 He might have had as much fun as they did at the party. He even wore one of my king sized pillow case robes. The first challenge they did was cross hot lava lake, which was two red table cloths staked to the ground with little stone steps across it. It turned out that these were too many steps and we cut it down by half after everyone had gone once. Here's Ethan balancing on two stones after we had reduced the number. Much more challenging. Side note: I was worried that these "challenges" would be too cheesy for the 8 year olds. Boy was I wrong. They loved them. I was pleasantly surprised. 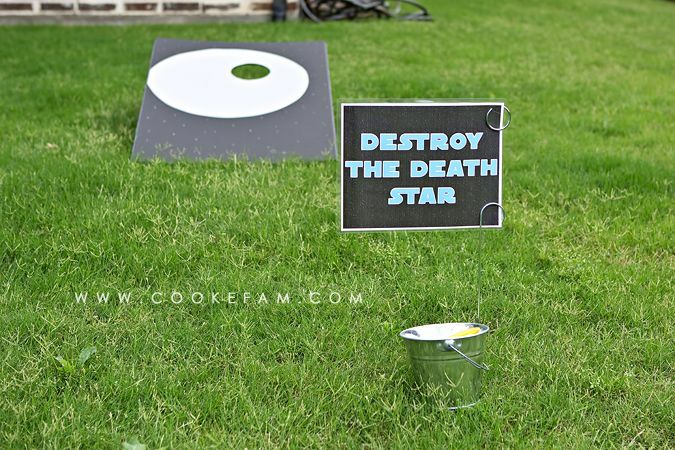 The next challenge was a bean bag toss called, Destroy the Death Star. This idea was straight from Pinterest too. I just took a black foam core presentation board (the tri-fold kind) and cut the two sides so that it would lay at an angle on the ground. Then I took a grey piece of poster board, cut it into a giant circle, and glued it on. Then I cut a big hole in both for the bean bags to drop through. There were 6 bean bags, so they had 6 tries to make it in the hole at least once to complete the challenge. Every single one of them made it in at least once. And yet again, this was much more fun for them than I ever expected. It cracks me up that Logan's belt is down around his ankles but he's not stopping for that. 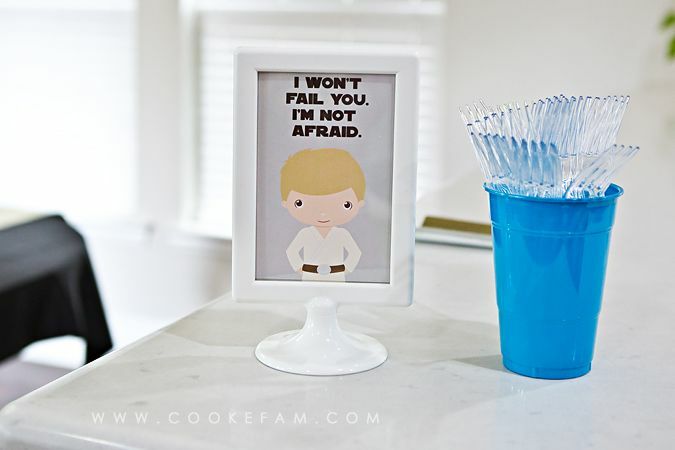 He's also not going to set that light saber down. 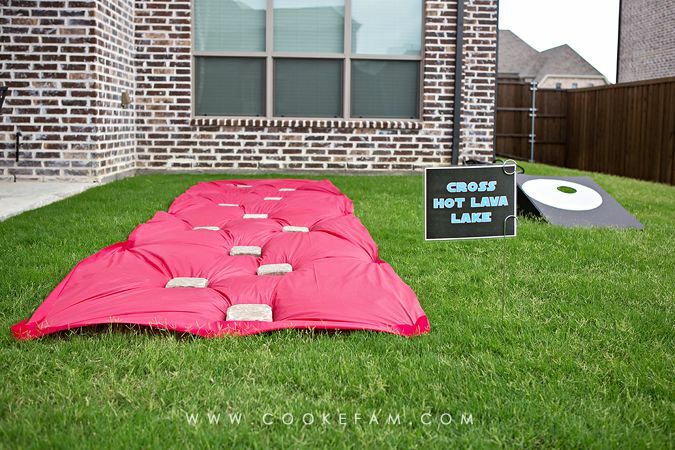 For our friend Brennan, he was on his last bean bag and hadn't made one in yet. 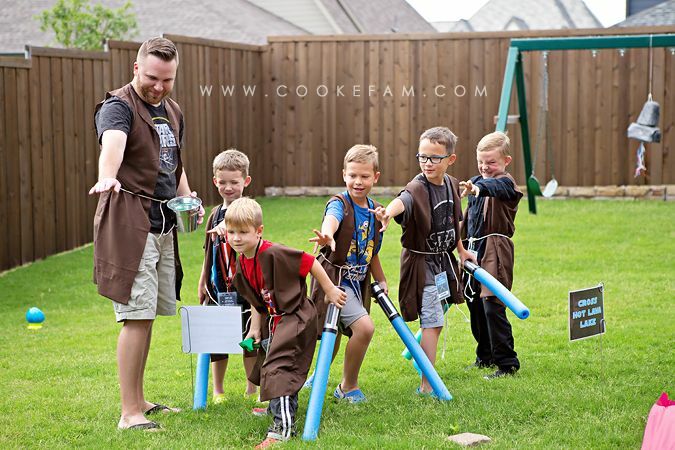 So Casey told them all to use the force to help him make it...and he did! They thought that was SO cool. And this shot below may be my favorite from the whole party because of their faces. 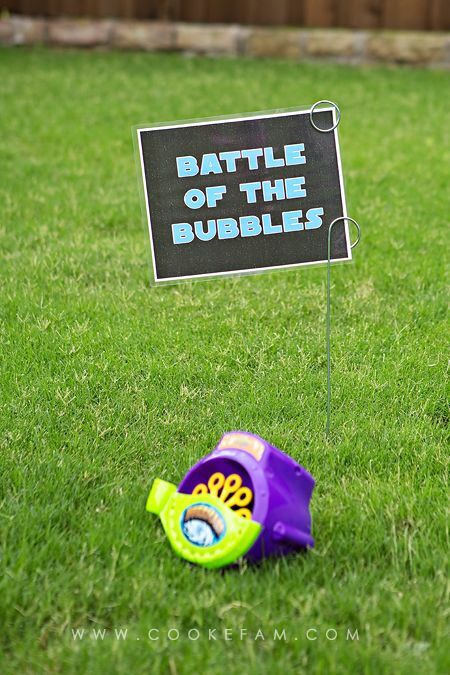 Next up was the Battle of the Bubbles. 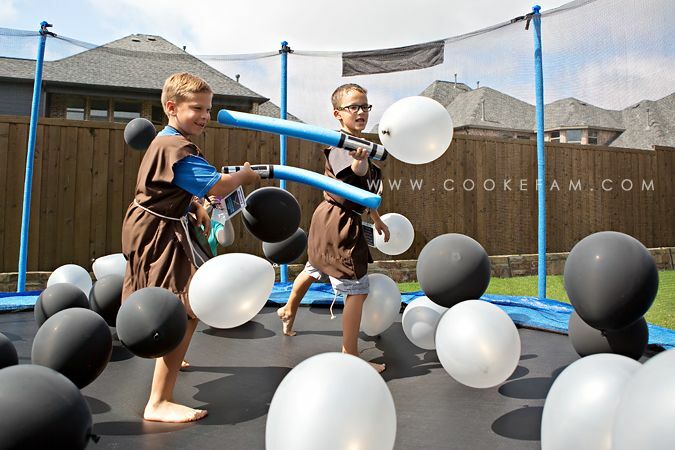 I had two bubble machines and had envisioned just turning them both on and letting the boys loose to pop the bubbles with their light sabers. 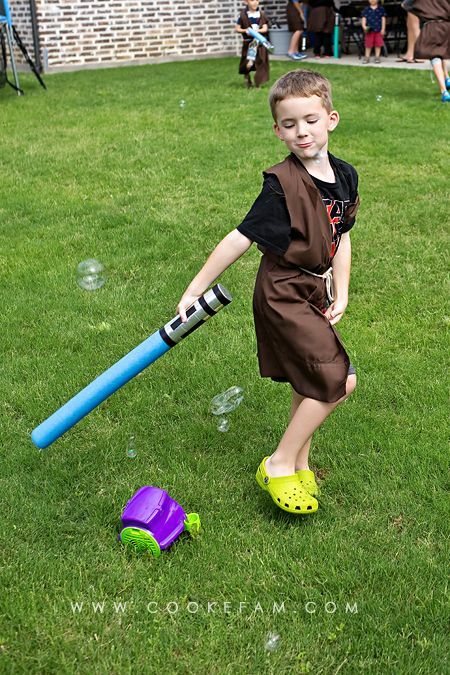 But, Jedi Master daddy had other plans. He had them take turns again and go one at a time. He even had them close their eyes and see how many bubbles they could pop that way. I think that turned out to be a great idea. 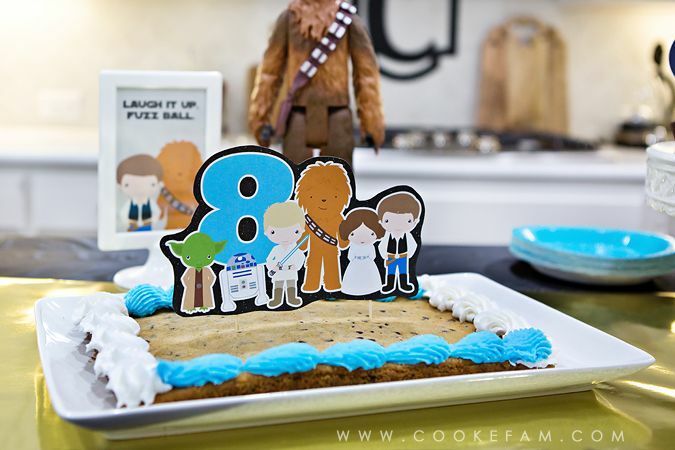 The boys loved this one too. I didn't get many photos of this activity, though, because some of our guests had just arrived and I went to greet them and get them dressed to join the fun. 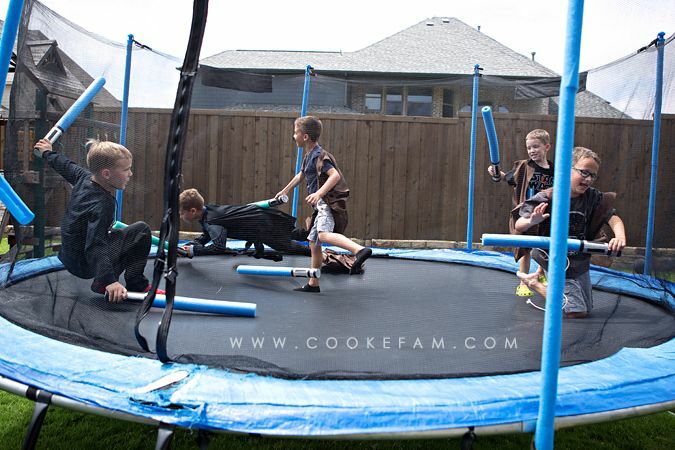 After winning the bubble battle, it was time for the Meteor Challenge on the trampoline. I blew up 40 balloons (which looked like a lot more inside the house than on the trampoline, but it was still enough). After some instructions on what to do, they took turns going two at a time and whacking at the meteors (balloons). The rest waited patiently in line for their turn. 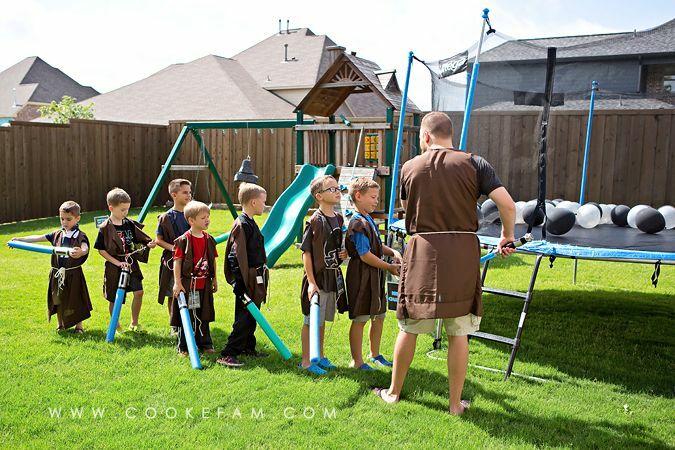 For a bunch of little boys at a party, they did remarkably well following instructions and waiting. I was impressed. 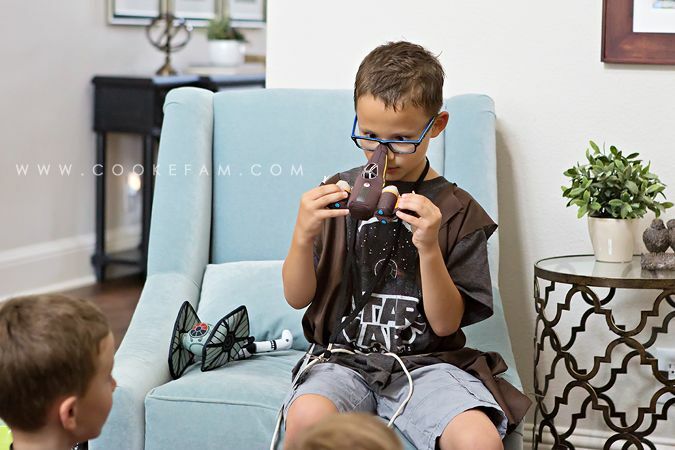 Logan beating balloons like it's his job. 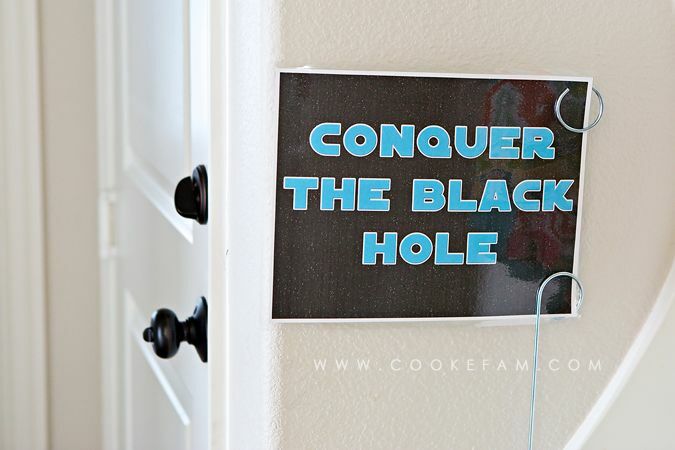 The next challenge was in the garage...Conquer the Black Hole. 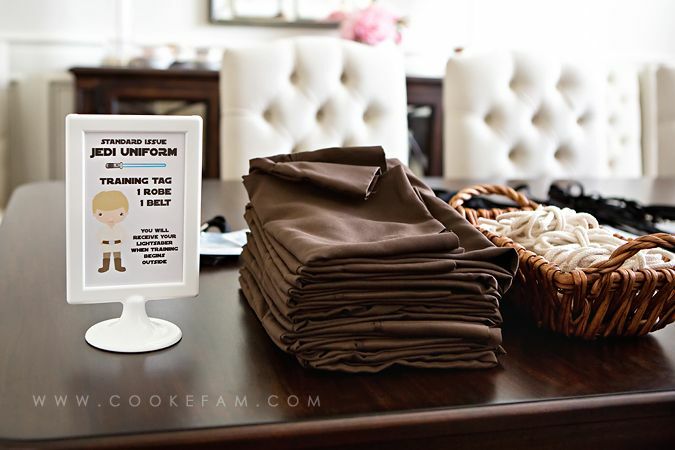 I saw this idea on Pinterest too, but didn't execute it in exactly the same way...mostly because we ran out of boxes. 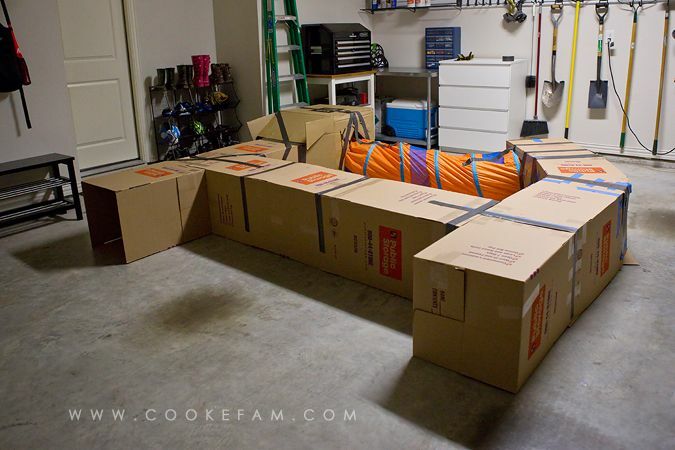 The "black hole" was a very basic maze of boxes taped together (along with our play tunnel). The most fun part of this challenge was that we turned out ALL the lights and they had to find their way in the dark. Surprisingly, none of them were scared and they all said this was their favorite thing. I ran out of time, but I wanted to tape some glow sticks on the inside top of the boxes to give them a little light, but they seemed to enjoy the darkness. We saved Defeating Darth Vader until the very last. 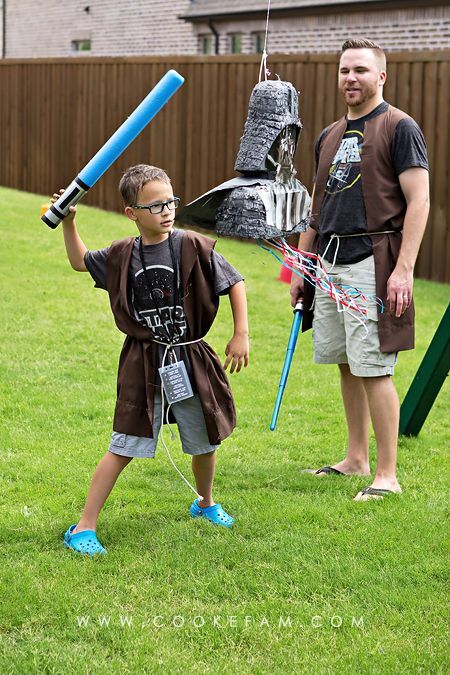 I had thought about having Casey or some other adult dress up as Darth Vader and fight with each child kind of like at Disney World. 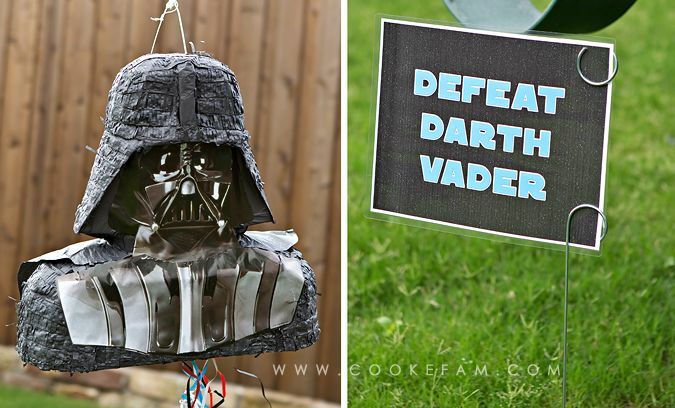 But then I saw this pinata and knew that Ethan had always wanted one at his party. We lined up the kids from smallest to largest with Ethan at the very end. 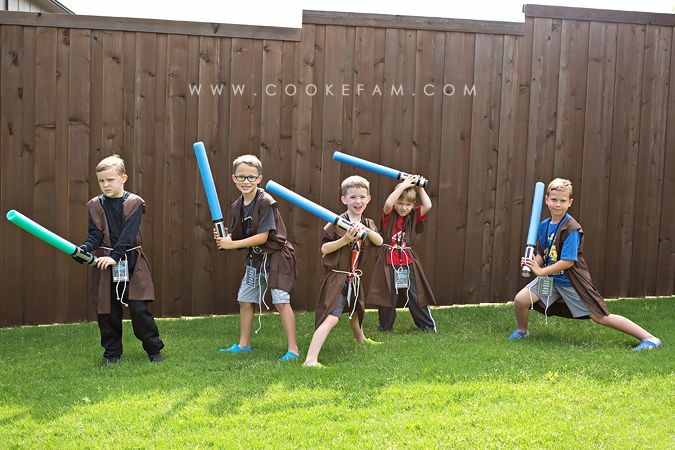 They each got to hit Darth Vader with their light sabers as hard as they could. 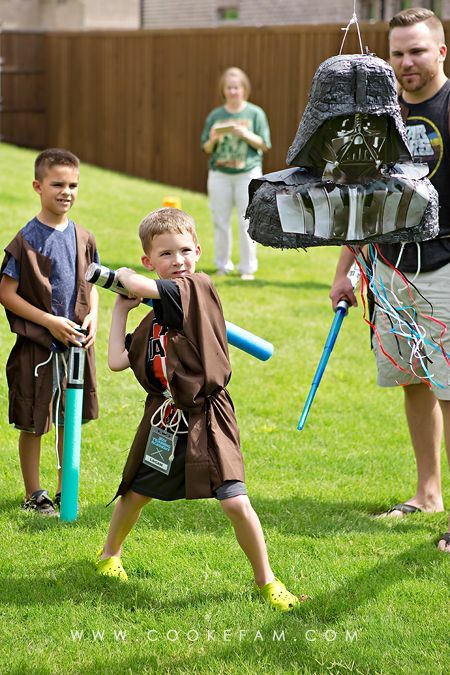 We knew, of course, that the light sabers would not even dent the pinata, but they got to have fun hitting it and we got to save the breaking part for the birthday boy. ...before switching to a wooden baseball bat. It still took several good swings to bring it down because the swinging motion kept the swings from having as much impact. 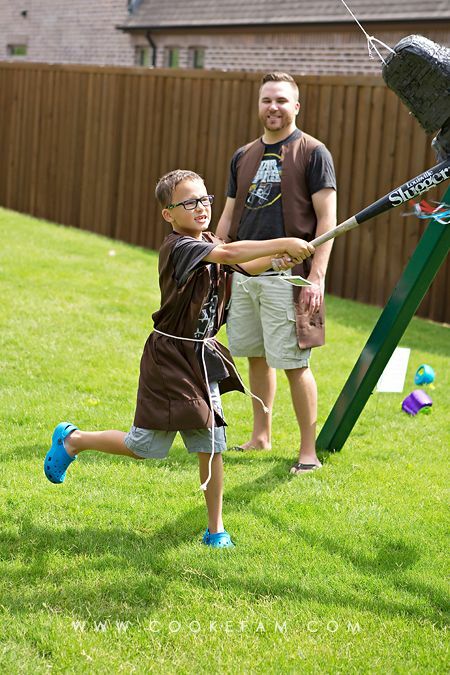 We hung the pinata from our swing set. But he finally did bring it down and then busted it even more open on the ground. The kids swarmed for the little bit of candy I'd put inside. After that last challenge, everyone had earned all their gold stars and training was complete. It was time for pizza! 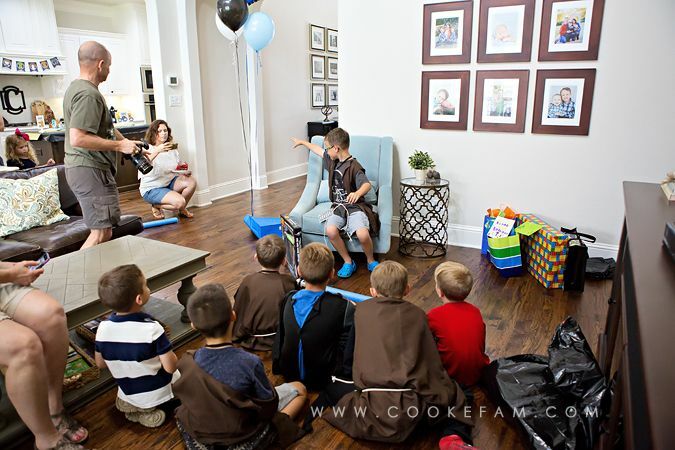 After everyone finished eating, we went inside to watch Ethan open his gifts. 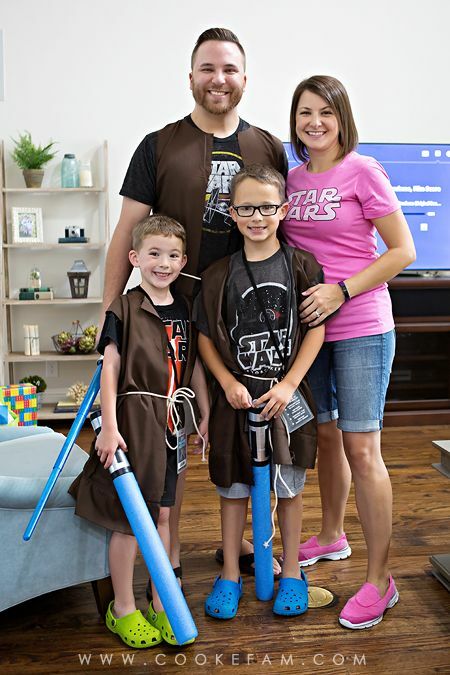 I had the idea to place two light sabers in front of Ethan on the floor and told the kids to sit (and stay) behind them. And it worked! No one crowded in front like they always do...making it hard for the rest of us to see and impossible to get good photos. 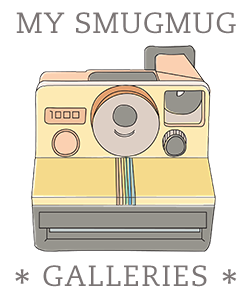 I'm remembering that one...apparently all they need is a physical reminder of the boundary! 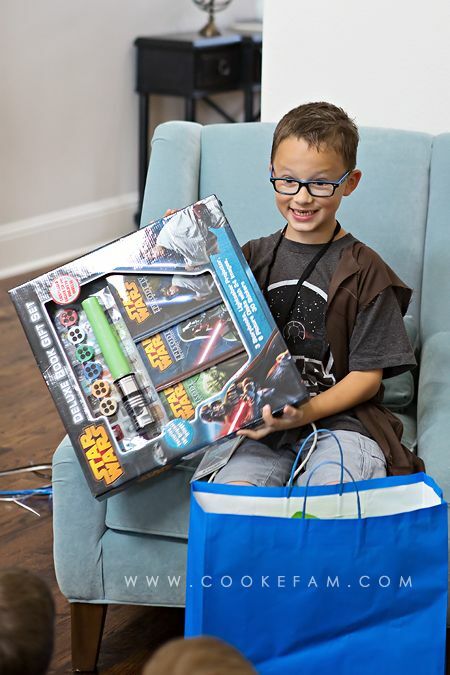 The kid loved his gifts! 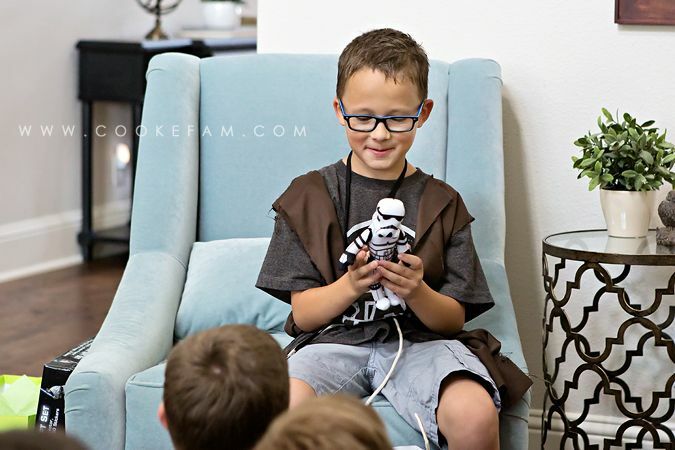 Logan got him this storm trooper as well as the x-wing and tie fighter plush toys pictured in the next photo. 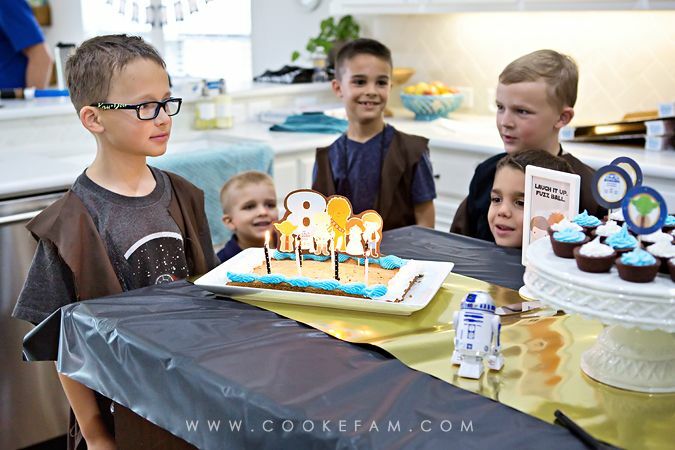 Right after presents, we sang happy birthday to Ethan so we could have some treats. 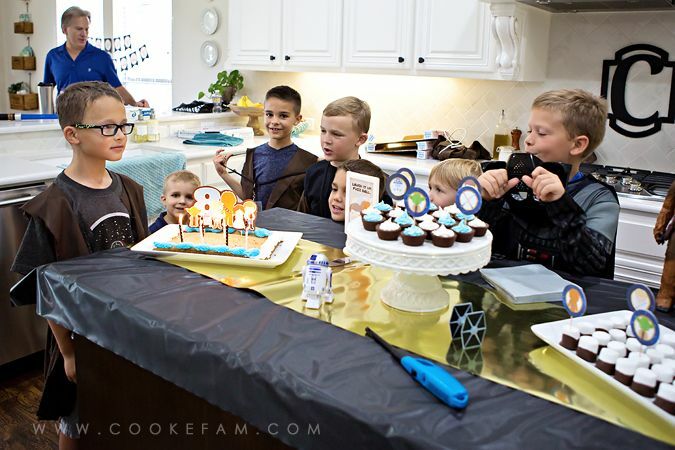 Everyone pretty much ate the cookie cake as fast as possible because I'd told them they could have "free play" at the end of the party. They could choose whichever challenge(s) they wanted to do again. 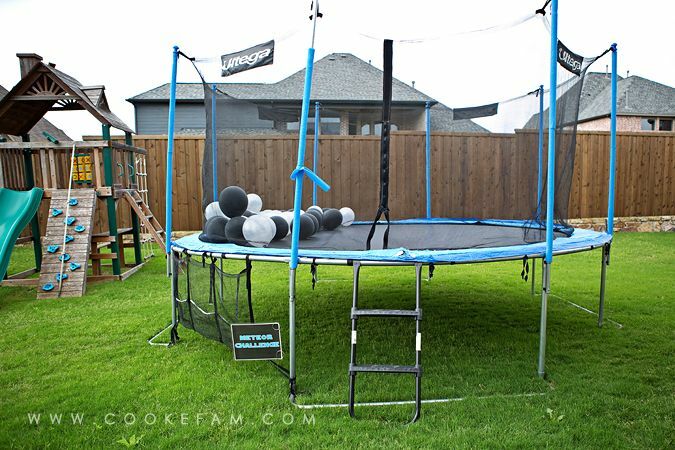 The two favorites were the trampoline with balloons and the black hole in the garage. 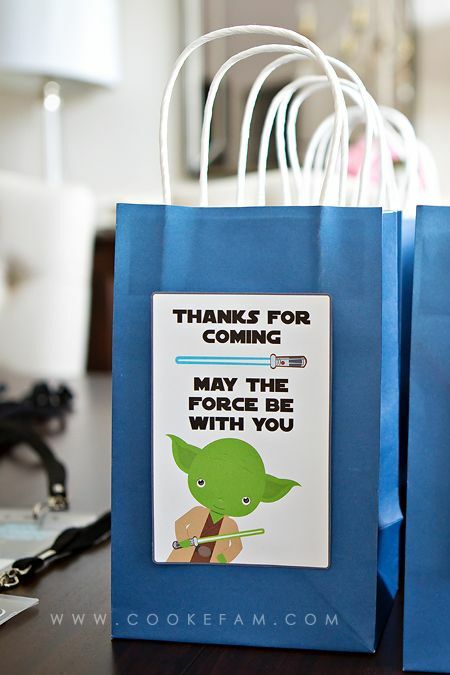 When the kids left, they got a treat bag with a Star Wars Pez dispenser and two glow bracelets inside. 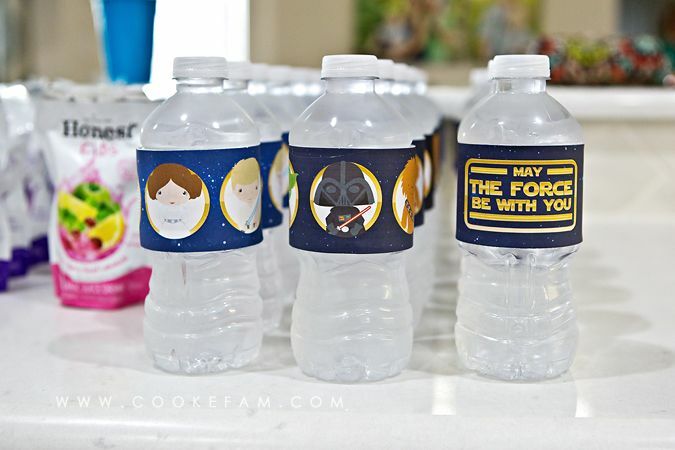 They could also take their robe, training tag, and light saber home with them too. 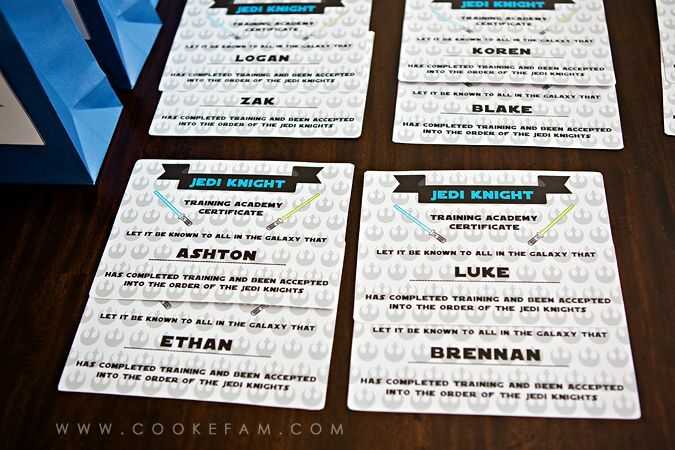 And they also got their official Jedi Certificate saying that they had completed their training. 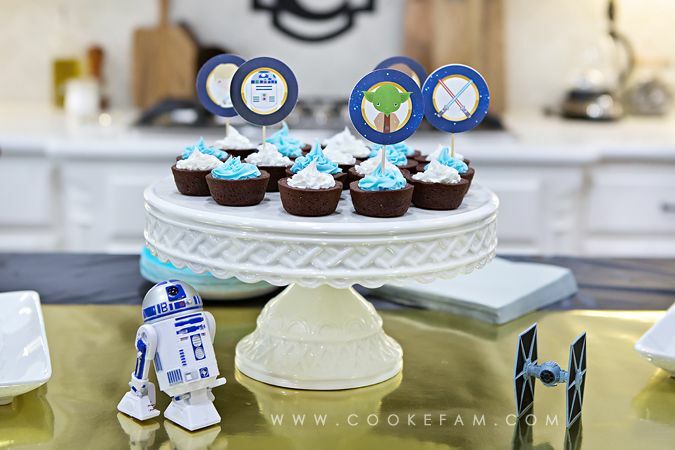 This was such a fun party. I hadn't planned as far ahead as I usually do (mostly because of our Disney trip) and we even had a hard time finding a date for the party...settling on the Saturday of Memorial Day weekend...not my first choice. But, everything came together and we're all still talking about how much fun we had.